DDOT's proposed bike lane on Pennsylvania Ave would run along the street's currently unused median. Photo: TheCityFix. Last night, the District Department of Transportation (DDOT) shared its proposals for new bike lanes in downtown D.C. Protected cycle lanes are planned for Pennsylvania Avenue as well as 9th, 15th, I and L Streets. Greater Greater Washington posted a street-by-street description of the proposal. Basically, one-way lanes will be installed on the sides of the streets, with the exception of Pennsylvania Ave, where a bidirectional lane will be located in the currently unused median. It will stretch from 15th Street to 3rd Street. 9th Street will have a one-way, right-side bike lane flowing with southbound traffic as well as a one-way contraflow cycle lane (like the one on 15th Street) between Pennsylvania Ave and Mount Vernon Square. On I Street, a one-way westbound bike lane will be located on the left side of the street from New York Ave to Pennsylvania Ave. For commuters heading eastbound, a one-way bike lane will run along the left side of L Street from Pennsylvania Ave to Massachusetts Ave. And right-side bike lanes going both directions will be installed on 15th Street between I Street and Massachusetts Ave. At the northern end, these will connect with current 15th Street bike facilities. 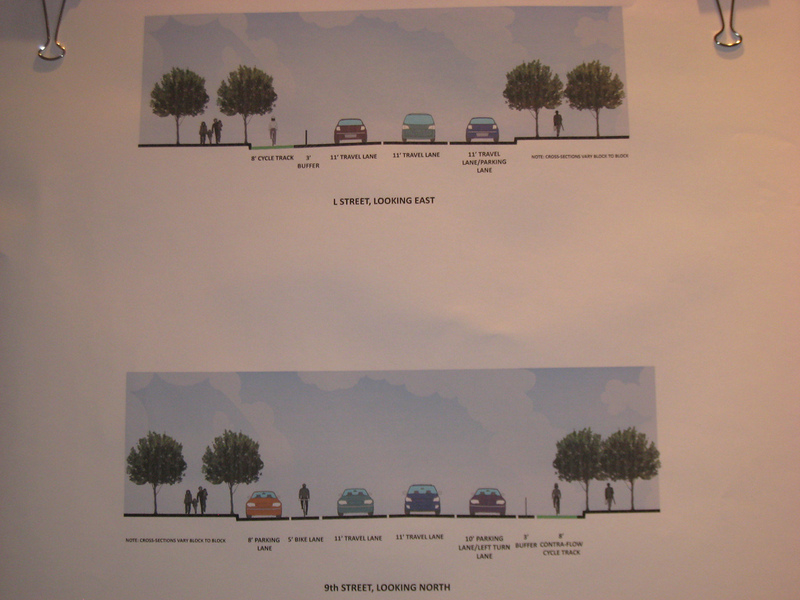 Renderings of proposed bike lanes on L and 9th Streets. Photo: TheCityFix. The lanes will likely be painted green except in areas of potential conflict with other vehicles, as a warning to cyclists to be wary (this is the opposite of New York’s scheme, where conflict areas are painted). 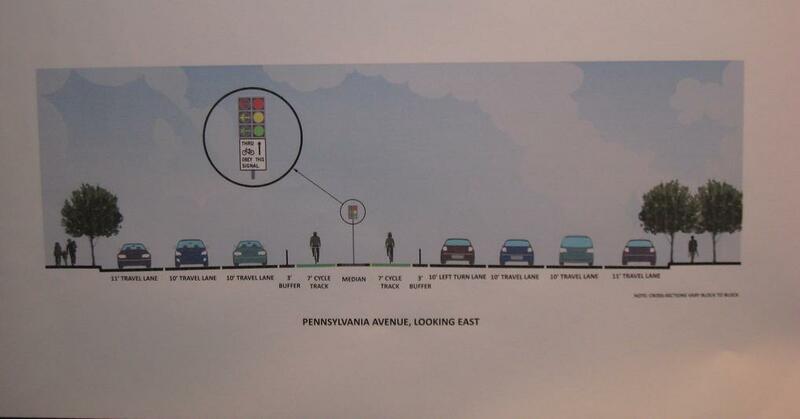 The marking of Pennsylvania Ave’s cycle lane is still in question due to concerns over the viewshed on the avenue. DDOT presented statistics illustrating the value of its planned investments. When separated bike lanes were implemented on 9th Ave in New York City, injuries to all street users fell 56%, injuries to pedestrians fell 29%, and injuries to cyclists dropped by 57%. Cycling in New York as a whole went up 26% after bike lanes were installed. Interestingly, biking went up 18-20% on cycle tracks (which use parked cars to separate bikes from traffic), as opposed to only 5-7% on conventional bike lanes. On 9th, 15th, I and L Streets, bike lane installation will require the removal of a motor vehicle lane. DDOT has done some initial traffic modeling to predict the impacts of this change, which has produced positive results. Little change in auto Level of Service was seen on Pennsylvania and L Street. The biggest impact will likely be felt on I Street. To minimize the impacts on traffic, DDOT will maintain all lanes at intersections, requiring bikes to share the lane with cars in some cases. The agency presented six different options being considered for left turn configurations, some of which were fairly complicated. Getting cyclists used to these arrangements, which will probably vary street by street, will take some education, as WashCycle pointed out. The plan has the support of the Golden Triangle and the Downtown Business Improvement Districts, who have been studying its impact on businesses. DDOT will incorporate minor changes based on a review of comments at last night’s meeting, refine the designs and break ground in April. They hope to have the Pennsylvania Avenue facility ready for commuters on Bike to Work Day May 21. The rest of the projects should be completed by the fall.